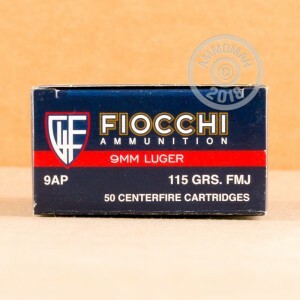 Get some cost-effective trigger time with your 9mm Luger pistol using this ammunition from Fiocchi. 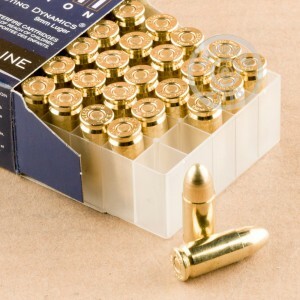 These 9mm Parabellum cartridges fire a light 115 grain full metal jacket bullet and produce a muzzle velocity of 1,200 feet per second. Fiocchi ammunition is made in both Italy and the United States. However, most Fiocchi centerfire ammo sold in the US is made at Fiocchi of America in Ozark, Missouri. Rack up some savings at AmmoMan.com with free shipping on all orders over $99! The more Fiocchi ammo I buy the more I like it !!!!!!!!!!!! I had not bought Fiocchi ammo before, and I shoot a lot, but I took a chance and I'm glad I did ! Clean and accurate. I have now bought several thousand rounds, FMJ and JHP, and they're both great.The service and amazing speed of delivery from Ammoman has always been unbeatable !!! They have developed a loyal customer !!!!!!!!!! !